Elder Scrolls Online for consoles delayed…by six months? The Elder Scrolls Online, Bethesda’s new MMO set in the universe that houses the worlds seen in Skyrim and Morrowind has been out on PC for over a month. It’s pretty divisive, with some unimpressed by the buggy game, and others wholly enraptured by its fantasy setting. The game was supposed to hit The Ps4 and Xbox One next month – but it looks like it’s going to be delayed. Bethesda hasn’t officially said as much, but a line, along with a broken link on their website’s FAQ said there would be a delay of up to six months. that line has since been excised from the site – so it’s likely that it went live before the official announcement. 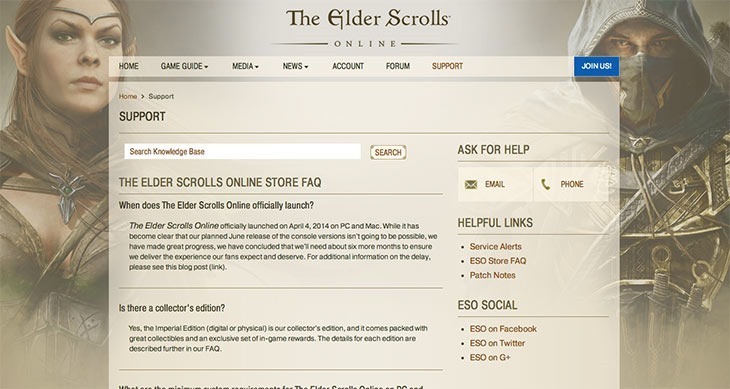 "The Elder Scrolls Online officially launched on April 4, 2014 on PC and Mac," said the F.A.Q, "While it has become clear that our planned June release of the console versions isn’t going to be possible, we have made great progress, we have concluded that we’ll need about six more months to ensure we deliver the experience our fans expect and deserve." Like we saw with Diablo 3, maybe the PC version is being used as a beta, until the fully-functional console versions are released. Still, the wait will be unbearable for fans of the Elder Scrolls universe who had planned to get this on console – but at least it’ll probably actually work then. In six months time, it’ll probably even have become free to play.